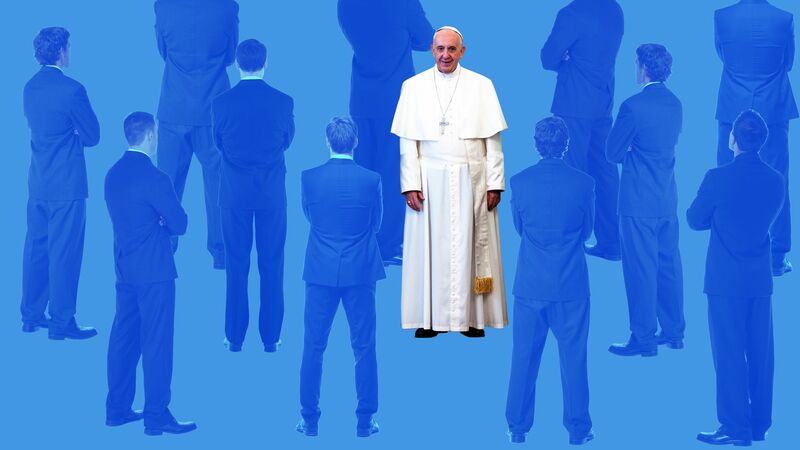 Axios' Amy Harder scoops... Pope Francis is hosting a gathering next week at the Vatican with executives of major oil producers and investment firms to talk about how the companies can address climate change, according to several people familiar with the event. Situational awareness: One year ago today, Trump announced his intention to withdraw America from the Paris Climate Agreement, which now has support from every country except the United States. Three years ago, Pope Francis wrote his encyclical — a papal letter sent to all bishops of the Roman Catholic Church — on the importance of addressing climate change, a first in the church’s history. Multiple sources said ExxonMobil would be represented, though a company spokesman couldn't confirm late Thursday. John Browne, former CEO of BP and current executive chairman of L1 Energy, an oil and gas investment firm. Go deeper: Amy's got much more in the Axios stream. An exclusive Axios/SurveyMonkey poll finds that even though most of the public is still wary of electric vehicles, EV sales have room to grow massively in the U.S. — because even the small percentages of people who say they're interested suggest a market far bigger than the current one. By the numbers: 14% of U.S. adults say they're either "extremely" or "very" likely to go electric with their next car purchase or lease, while a combined 62% said they would probably steer clear. Another 23% said they were "somewhat likely" to get an electric car. The big picture: Sales of pure electric and plug-in hybrid electric cars in the U.S. last year were close to 200,000 combined. That's a little more than 1% of the country's roughly 17 million auto sales. That means if the preferences revealed in the survey begin translating into actual consumer behavior in coming years, sales that are already growing are poised to expand greatly. “Those numbers actually tell us that, given the level of education of the market as it is now, there is still quite a lot of space to grow for electrification,” Bloomberg New Energy Finance analyst Salim Morsy tells Axios. Yes, but: There are still plenty of factors that can prevent pro-electric consumers from making the leap, including limits on vehicle availability in some regions and the number of models to choose from. Go deeper: We've got more polling results in the Axios stream. White House plan: Bloomberg broke a story last night about the emerging structure of long-discussed Trump administration efforts to aid economically struggling coal-fired and nuclear power plants. Why it matters: Per their story, the plan would "represent an unprecedented intervention into U.S. energy markets." One level deeper: The news service obtained a memo — circulated ahead of a National Security Council meeting scheduled for today — describing plans for Energy Department use of emergency powers to force grid operators to buy power or power capacity from at-risk plants. "The agency also is making plans to establish a 'Strategic Electric Generation Reserve' with the aim of promoting the national defense and maximizing domestic energy supplies," Bloomberg reports. To be sure: Bloomberg notes that there's "no indication whether" Trump has signed off on the plan or when it might be implemented. Between the lines: The story is the latest twist in intense political and lobbying battle over the fate of power plants that will or might go offline under market pressure from cheap natural gas, stagnant demand and the growth of renewables. Administration officials argue that action to keep coal and nuclear plants going is essential for the reliability and resilience of the power system, but the claim is hotly disputed by many experts. State of the market: Per Reuters, "Global oil markets have been roiled by a surprising divergence between the world’s major benchmarks, Brent crude and its U.S. counterpart, which in recent days have traded at odds with one another, wrongfooting investors betting on the exact opposite." Tough out there: That Reuters item and this Wall Street Journal feature delve into an increasingly hot topic — how infrastructure constraints in the Permian Basin are creating financial headaches for producers. "Oil delivered at the Midland Hub in the booming Permian Basin is now about $10 a barrel lower [than where WTI is trading] or nearly $20 below Brent. Analysts at Raymond James see that continuing until late 2019 when more pipelines relieve the glut," the WSJ reports. Offshore: Shell on Thursday announced the start of production from from the first phase of its Kaikias project in the Gulf of Mexico, which the oil giant expects will produce up to 40,000 barrels of oil-equivalent per day. One reason it matters: the announcement of a production start-up, a year ahead of schedule, shows how companies have lowered offshore costs. "Shell has reduced costs by around 30% at this deep-water project since taking the investment decision in early 2017, lowering the forward-looking, break-even price to less than $30 per barrel of oil," Shell said. Dive deeper: Rigzone has more on the project here. Thursday brought a burst of state-level actions to support wider deployment of EVs despite recent administration moves to lessen efficiency standards (h/t to Bloomberg). SDG&E to provide rebates to residential customers to install up to 60,000 charging stations. PG&E to install infrastructure in at least 700 sites to "support the electrification of at least 6,500 medium- or heavy-duty vehicles." Why it matters: "The approved plans mark the state’s largest investment in electrification to date and build on smaller-scale utility-sponsored EV programs now underway," Greentech Media writes in this detailed piece. "The [New York] Power Authority is installing 400 public chargers at airports, train stations and municipal parking lots, and high-speed chargers are planned for Thruway service areas between New York City and Buffalo," AP reports. New Jersey: The state's big power company, PSEG, announced a $300 million EV infrastructure plan as part of its much larger, five-year, multi-billion dollar investment cycle, per northjersey.com. Over in our Export Voices section, David Hume writes that tidal energy has been slow to develop into a reliable form of grid power, but recent demonstration projects suggest that might be changing. Why it matters: If the technology continues to mature, tidal energy could become a significant renewable power source in many countries. The problem: Although energy developers have long sought ways to exploit ocean tides to generate electricity, few large-scale projects are actually running in the water. That's because operating in the ocean poses a frustratingly difficult engineering problem: Corrosion, biofouling and extreme wave and current forces all contribute to the slow destruction of devices. Density: Water is 784 times denser than air. This means, at least in theory, that a tidal energy converter has a smaller physical footprint than a solar or wind array producing the same amount of power. Tides are predictable and easy to forecast — not just hours in advance, but decades, which makes grid integration easier. What's new: Last month, Atlantis Resources, a U.K.–based tidal energy developer, announced that its MeyGen project has cumulatively delivered about 6 GWh to the grid since it was connected a year ago. Read more of his full piece in the Axios stream. Hume is a marine engineer contractor supporting the U.S. Department of Energy Water Power Technologies Office's marine renewable energy portfolio and founder of The Liquid Grid. The views expressed are his own.